I recently saw a very cute card on Kez's blog, which inspired me to make my own woolly creation. Thank ewe very much for the inspiration Kez! I have been feeling a bit mojo-less and baaaaaaaa-dly needed some help ;-). I decided that I would make my sheep using felt and dies. Having been to the Canberra Show only last weekend I was aware that Suffolk Sheep have black faces, ears and legs...however, I do not have any black felt (yet)...so chocolate brown it was...and so we have a muddy Suffolk sheep! When I finished designing my sheep I decided her face looked oddly feature-less (with only the goggling eyes), so I spent an age placing various bits and pieces on her face trying to rectify the situation, and finally settled on an Orange Zest button (as you do). Looking back on her now, I can't decide whether it is supposed to be a mouth, a dummy, a gas mask mouth-piece (something I saw on an episode of Stargate Atlantis recently) or none of the above. More than anything I think it just makes her look like her ancestors were crossed with a mutant pig at some point....and so we get a muddy mutant-mouthed Suffolk sheep-pig (clear as mud eh?...YES the sleep deprivation is really messing with my head ;-). Accessories: Kiwi Kiss Patterns DSP (SU), Styled Silver Hodge Podge Hardware (SU), Limitless Layers: 1 3/4" Circle Collection (PTI), Beautiful Blooms II #3 Die Collection (PTI), Cupcake Collection (PTI), Sunshine Impression Plate (PTI), Orange Zest Vintage Button (PTI), Dark Chocolate Wool Felt (PTI), Vintage Cream Wool Felt (PTI), Small Oval Punch (SU), Tangerine Twisted Paper Cord (Annabelle Stamps), Goggling Eyes (misc), Sticky Strip (SU), Mini Glue Dots (SU) and Tombow Mono Adhesive (Penwa). 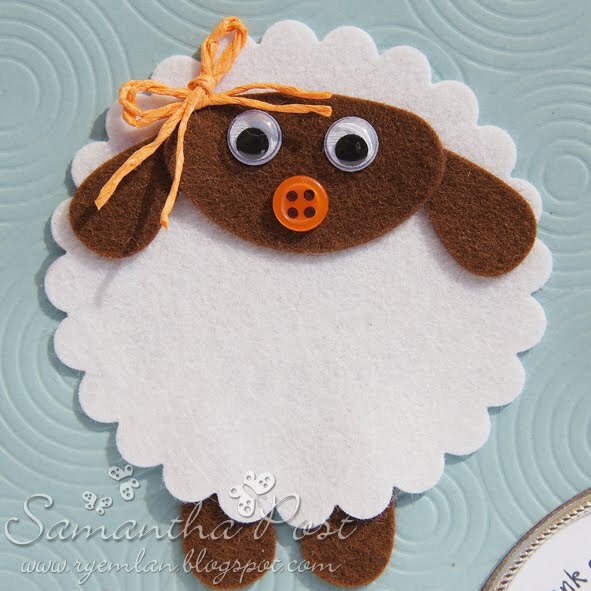 I cut enough pieces of felt for seven of these sheep...so I am going to have to revisit the whole mutant-mouth thing before I assemble the rest of the cards. I really don't need seven muddy mutant-mouthed Suffolk sheep-pig cards now...do I? (Blogged to: Danger Zone - Kenny Loggins, My Delirium - Ladyhawke and Onion Skin - Boom Crash Opera). Ewe crack me up! That was a fun read and love the music you were playing! Gorgeous little card, mutant or not lol. He's one cute sheep Sam - muddy or not. I reckon go with a dummy - the gas mask makes me think of a creepy Dr Who episode I saw and he's too cute to be creepy!! Catch you soon I hope! Too cute Sam - love all the puns too!! Yes, sleep deprivation will do that to EWE! Sam, you must be missing out on your small kid television viewing otherwise you would know that this little sheepie looks EXACTLY like the baby lamb on Shaun the Sheep! Adorable sheep Sam. Love the card.